There is a significant amount of confusion about DNA matching and which ancestors and ancestral lines can match in which way. To review, there are 4 different kinds of DNA that we can utilize for genealogy, the Y DNA for males, mitochondrial, X chromosome and autosomal DNA for both males and females. You can read an intro article about how these different types of DNA are utilized here. Clearly, the mitochondrial DNA addresses only one line – your mother’s matrilineal line, shown in red below – and the mitochondrial DNA is never divided or mixed with that of the father. So you share the mitochondrial DNA with thousands of generations of your matrilineal ancestors. You’ve accumulated a few mutations over those generations, which serve to show us who you are most closely related to. The Y chromosome is passed only from father to son, shown in blue above. If you haven’t read this article I wrote about X matching, please do. Males and females have a different inheritance path for the X chromosome because males don’t inherit an X from their father’s, but females do. Even better, if you utilize software that can interface with Progeny Software’s Charting Companion, by all means, purchase this add-on program because it shows you on your own tree which of your ancestors X chromosome you have the potential of carrying. I wrote about how to utilize this great tool here. The X chromosome acts like autosomal DNA, the DNA we receive from all of our ancestral lines, including red and blue lines above, and all of the blank ones in-between, meaning that the X chromosome is a candidate to be recombined and divided in each generation. I say a candidate, because sometimes the X is passed in very large pieces. Not quite what or how we might expect. I wrote about that here. But we can’t and don’t know whose X we carry, or which pieces of which ancestors’ Xs we carry – but we do know, based on how DNA is passed generation to generation, whose X DNA we MIGHT carry – and whose we cannot carry. Because women inherit an X from both parents, and men only inherit the X from their mother, the inheritance pattern through the generations is different for males and females, so each person needs to plot out their potential X ancestors. 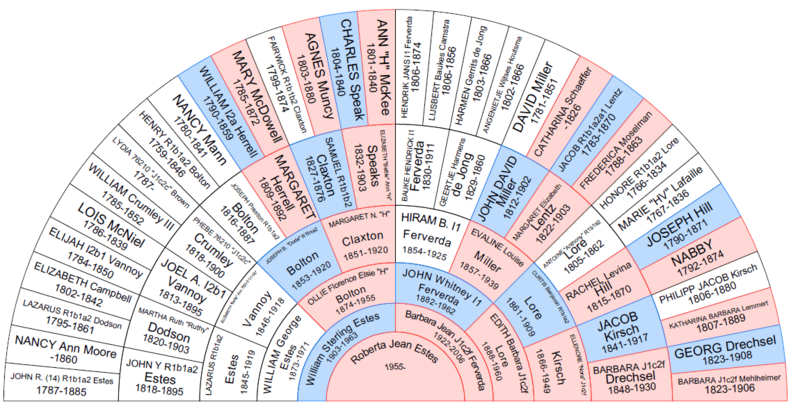 A female could carry some part of the X chromosome of any of the ancestors whose names would fall into the pink or blue boxes of this fan chart. You can NOT inherit any X from someone whose box is blank (no color). These blank charts are courtesy of Blaine Bettinger. He originally published them on his blog, The Genetic Genealogist, in December 2008 and January 2009 in his articles about how to use the X chromosome for genealogy. A male’s fan chart for the X chromosome looks a bit different because the male doesn’t inherit an X from his father. Instead, he inherits the Y chromosome which makes him a male. So let’s see if we can approach this combination of information and DNA test types in a bit of a different way. A female can inherit the following kinds of DNA from the ancestors listed at the left in the chart below. This chart compiles information from all of the 4 different types of DNA that we can use for genealogical purposes. Generation number is in parenthesis. Here’s how to read this chart. This same chart for a male would look somewhat different, but only in the X and Y columns. So, how could this help you with your genealogy? Let’s say that you match someone on the X chromosome, but you know that you are not a mitochondrial match. You can look on this chart and eliminate any line that includes a mtDNA match. You know your X match is not from that line. You can also eliminate any ancestral line that does not include a potential X match. The ancestors you are left with are your possible match ancestors. Let’s use the female chart below as an example. The greyed out ancestors are those removed by virtue of no mitochondrial DNA match, so anyone with a Yes in that box. It also eliminates anyone who could not contribute an X chromosome, so with a No in that box. Any greyed out box eliminated that specific ancestor from consideration. Please note that by eliminating your mother, it does not eliminate her entire line. It only means, in this case, that if your mitochondrial DNA doesn’t match, then you and your match don’t share a common mother. Your mother’s father is still a possibility. And you can still match on just the X but not through the dual mito line. Therefore, only the ancestors left unshaded are candidates for matches. Of course, on a male’s chart, the X becomes much more restricted due to the fact that men inherit the Y chromosome and not the X from their fathers. You’ll notice that if a specific ancestor carries a matching Y chromosome, they cannot carry the matching X – they are mutually exclusive. As you can see, by the time we’re done eliminating possibilities, there are only three possible ancestral lines to pursue for the X match who doesn’t match on the Y or the mitochondrial DNA. Conversely, if you have someone who matches on the X AND on a mitochondrial line, that is a huge hint and that line would be the first one I would pursue. You can expand this chart to any number of generations. I stopped at 3 for illustration purposes. While this methodology doesn’t exactly tell you who your common X matching ancestor is, it certainly narrows the playing field substantially. Finding an X chromosome match can be a real bonus, especially when combined with other types of DNA testing. This entry was posted in Autosomal, Mitochondrial DNA, X Chromosome, Y DNA and tagged Introductory DNA by Roberta Estes. Bookmark the permalink. Well, Roberta, this article is a keeper for my file, and to forward to friends. BTY, you are a keeper, also! Thanks, as always, for your articles to enhance our knowledge of the science of dna. You are appreciated! Soo – if I (F) match any man on the X chromosome, Our match HAS to be on his female line? I am assisting my half-aunt, who was a foundling in 1944. Through the magic of DNA, we have identified her biological father (my maternal grandfather) and on 1 July she met three of her half siblings. Now we turn our attention to her biological mother – who is still unknown. MtDNA has not helped and X matches could come from either line. Her closest match (besides my mother) was a good candidate as he didn’t match me or my mother, but when I look at his other matches I find that he matches people both my mother and I do. This is true for almost all of her closer matches. I’m stumped. Unfortunately, 23andMe is the only service that reports all of your X chromosome matches. So be sure to use GEDmatch if they ever get up and running again. However thought i might throw a spanner in the works here with this rare situation that people should perhaps be aware of if DNA results are not what was expected. Lydia Fairchild and her children are the subjects of a British documentary called The Twin Inside Me (also known as “I Am My Own Twin”). Lydia Fairchild was pregnant with her third child when she and the father of her children, Jamie Townsend, separated. When Fairchild applied for welfare support in 2002, she was requested to provide DNA evidence that Townsend was the father of her children. While the results showed Townsend was certainly the father of the children, the DNA tests indicated that she was not their mother. This resulted in Fairchild’s being taken to court for fraud for claiming benefit for other people’s children or taking part in a surrogacy scam. Hospital records of her prior births were disregarded. Prosecutors called for her two children to be taken into care. As time came for her to give birth to her third child, the judge ordered a witness be present at the birth. This witness was to ensure that blood samples were immediately taken from both the child and Fairchild. Two weeks later, DNA tests indicated that she was not the mother of that child either. A breakthrough came when a lawyer for the prosecution heard of a human chimera in New England (Karen Keegan) and suggested the possibility to the Fairchild’s lawyer, Alan Tindell, who then found an article in the New England Journal of Medicine about Keegan. He realised that Fairchild’s case might also be caused by chimerism. As in Keegan’s case, DNA samples were taken from members of the extended family. The DNA of Fairchild’s children matched that of Fairchild’s mother to the extent expected of a grandmother. They also found that, although the DNA in Fairchild’s skin and hair did not match her children’s, the DNA from a cervical smear test did match. Fairchild was carrying two different sets of DNA, the defining characteristic of a chimera. This is extremely, extremely, rare. How would this show up though if a person with this condition were to test on AncestryDNA or 23andme etc? IF they have 2 sets of DNA i wonder how that would appear in their results? I was reading your post on the Dodson’s with interest since some of my ancestors are Dodson’s. Then, almost through the article I see Jesse Dodson. I have a Jesse Dodson in my line who would have been a son or grandson to Jesse Dodson, I think. This DNA stuff is so confusing but I found so much pleasure in reading about Lazarus Dodson. Are you sure about this? I see the Mother’s Mother is a mtDNA match. If I rule her out, then I’d exclude her father, who is not an mtDNA match and therefore a possibility. The maternal line is not terminal, there is always a father (and a mother) just around the bend. It doesn’t rule out the woman’s entire line, just the particular person based on the combination of DNA tests. This chart doesn’t eliminate entire lines, just specific ancestors. Of course, if the mito doesn’t match, then that does rule out that specific line in term of the ancestor being matrilineal for both women, and if it DOES match, it give you a place to begin searching for the common ancestor. If the Mother’s Mother’s Father is a possibility for matching on the X and a father passes his X down to his daughter, wouldn’t the daughter be a possibility too? Roberta, while its true that an X match for a man must come from his mother’s side, it doesn’t always follow that an accompanying autosomal DNA match came from that same side. I had both my parents tested and phased the results on gedmatch. I have a number of X matches to persons who match me on other chromosomes via my father. So it means I am related to these people on both sides of my family. But without the aid of phased results, someone could easily misinterpret the origin of an autosomal match as being from one of their X-lines when its really not. Your column on X-Matches is very timely for me. I’ve been doing paper genealogy for quite some time but have started DNA genealogy only in the last couple of years. I began with GENO 2 testing, then Y-DNA 67 and most recently, Family Finder. Two days ago while looking around the site on the section where you can see advanced matches for the various tests, I happened to notice a box for X-Match. I checked the box and lo and behold, I see I have twelve X-matches…totally unknown to me prior to July 5, 2014. I wonder why X-matches are not displayed more prominently on the main home page? Roberta, I was scanning your posts to try to find the most appropriate place to put my question, and came up with this one. 🙂 At Family Tree DNA, the FMS is the most detailed mtDNA test. Do you know whether or not there can or will be a test in the future for the mitochondrial line that goes into even more detail? There is nothing more to test. The FMS – or Full Mitochondrial Sequence test tests all 16,569 locations on the mitochondria:) So there is nothing more to test. I wish there was. Ahhhh. Don’t I too…? Well, this is good to know. Thanks! E Ballard: You did not state your objectives for testing. What are you looking for? Mtdna is mother to mother and usually goes back hundreds + years, really far back in time.. I have over 20 mtdna matches at FTDNA, and those who have had autosomal (atdna) testing also, do not match me because the matches are so far back in time.. Are you ” looking for love in the wrong places?”, meaning have you done autosomal testing which gives you cousins on both your matrilineal and patrilineal sides supposedly back 5 generations, but in actuality much further back? Many of my atdna matches are Colonial America. So many people are focusing on mtdna, when they should be focusing on autosomal to help them build a tree. Quite frankly, my first dna test was mtdna. Why? Because I did not know what I was doing. Thank you. I’m clear and understand the difference.